UPDATE: See the correction to the number of models under the heading of REDUNDANCY: WHY ARE TAXPAYERS FUNDING 5 CLIMATE MODELS IN THE U.S.? Redundancy: why are taxpayers funding 5 climate models in the U.S.? Why aren’t climate models providing the answers we need? WHY ARE TAXPAYERS FUNDING CLIMATE MODEL-BASED RESEARCH WHEN THOSE CLIMATE MODELS ARE NOT SIMULATING EARTH’S CLIMATE? The Intergovernmental Panel on Climate Change (IPCC) relies on climate models to attribute global warming and climate change to emissions of anthropogenic greenhouse gases and to simulate how climate might change in the future based on estimates of future emissions. But climate models are not simulating Earth’s climate as it exists now, has existed in the past, or might exist in the future. The climate science community understands this well, but few persons outside of that close-knit group have the faintest idea that climate models are not simulating Earth’s climate. Those are powerful statements. If you were to read Dr. Trenberth’s blog post in its entirety, you’ll find those quotes were reinforced by much of the remaining text. Occasionally, Trenberth interjected what could be considered global warming dogma to temper the critical aspects. The current projection method works to the extent it does because it utilizes differences from one time to another and the main model bias and systematic errors are thereby subtracted out. This assumes linearity. On that webpage, the IPCC then goes on to use this statement as their reasoning for large ensembles of models, illogically assuming that a collection of wrong models provides a right answer. It was only a matter of time until their “current projection method” failed. And it didn’t take long. If the “current projection method” had worked, the climate-science community would presently not be scrambling to come up with excuses for the slow-down in global surface temperature warming and the missing heat in the oceans. the climate model projections of future climate are aligned with the naturally enhanced warming from the mid-1970s to the turn of the century. Both of those factors suggest that climate model projections of future global warming may be two times too high. Because climate models cannot simulate modes of natural variability that enhance or suppress global warming, reliance on those models as they exist today for the study of global warming and climate change would be similar to physicians having to rely on computer models of the human body that cannot simulate respiration, digestion, circulation, etc. Simply put, climate models are virtual reality. They are no more real than the computer-generated imagery (CGI) of King Kong or dinosaurs or space aliens in movies. Let’s rephrase what the climate scientists are in reality telling us with their climate models projections: (1) if emissions of manmade greenhouse gases increase as projected by the numerous future scenarios, and (2) if Earth’s climate responds to those increases in manmade greenhouse gases as simulated by the climate models, then (3) climate might change as simulated by the models, but (4) the climate science community understands very well that Earth’s climate does NOT respond to those increases in manmade greenhouse gases as simulated by the climate models. Makes one wonder why they make the effort…other than to satisfy the wants of the political entities funding climate science. Note: In a postscript to this letter, I’ve included a few examples of model-data comparisons from my past blog posts, which show how poorly climate models simulate surface temperatures, precipitation and sea ice. (1) Sea levels will continue to rise regardless of whether we cease or slow our emissions of greenhouse gases…and there are still wide ranges of uncertainties with best-case scenarios overlapping with worst-case ones. (2) Glaciers and ice sheets will melt, providing their mass contribution to rising sea levels…but that is simply a continuation of the melting that has been occurring since the end of the last ice age, when temperatures rose to the point that ice on land melted. Glaciers and ice sheets will continue to melt until the temperatures drop and we head toward the next ice age. And that continued melting of glaciers and ice sheets will, of course, add to rising sea levels. (3) Some regions of the globe will experience drought, others floods…but even the current “state-of-the-art” climate models cannot tell us where or when those floods or droughts will occur because they still cannot simulate the annual, decadal and multidecadal variations in coupled ocean-atmosphere processes that impact precipitation globally. I’ll expand on this in an upcoming section. The United States has been investing billions of dollars in climate model-based science over the past 2 decades. Yet the reports keep telling us the same thing, over and over: temperatures will warm, sea levels will rise, etc. They’re not furnishing anything new of value and haven’t for some time. REDUNDANCY: WHY ARE TAXPAYERS FUNDING 5 4 CLIMATE MODELS IN THE U.S.? See the CMIP5 Climate Model Intercomparison Project webpage here. None of the models are simulating climate as it exists. Does the U.S. need 5 4 climate models and support staff for models that are simulating climate on a virtual planet that bears little relation to the one we inhabit? Correction: I was notified of the following by blogger Ken Gregory in a comment here. There were only 4 U.S. climate modeling groups that submitted model outputs to the CMIP5 archive. The CCSM4 model from NCAR is a subset of the CESM1 from NSF-DOE-NCAR. The CCSM4 model is now frozen, and all future updates will be made to CESM1. After multiple decades of climate modeling efforts, the climate science community has not produced models that are capable of providing the answers we need and deserve. There is a very simple reason for this: The focus of the climate science community. Under the direction of the Intergovernmental Panel on Climate Change (IPCC) and the political entities that fund climate science, the focus of climate research has been on human-induced global warming and climate change, not natural variability. Yet it is naturally occurring, coupled ocean-atmosphere processes that determine when and where surface temperatures and precipitation will increase and where they won’t. We always have to keep in mind that the Intergovernmental Panel on Climate Change is a political entity, not a scientific one. Their sole role is to assemble scientific papers that support a political agenda. Nothing more, nothing less. The Intergovernmental Panel on Climate Change was created in 1988. It was set up by the World Meteorological Organization (WMO) and the United Nations Environment Program (UNEP) to prepare, based on available scientific information, assessments on all aspects of climate change and its impacts, with a view of formulating realistic response strategies. The initial task for the IPCC as outlined in UN General Assembly Resolution 43/53 of 6 December 1988 was to prepare a comprehensive review and recommendations with respect to the state of knowledge of the science of climate change; the social and economic impact of climate change, and possible response strategies and elements for inclusion in a possible future international convention on climate. Thus, the IPCC was founded to write reports. Granted, they are very detailed reports, so burdensome that few persons read them in their entirety. Most people only read the Summaries for Policymakers…the language of which is agreed to by politicians during week-long meetings. Also from that quote above, we can see that the language of the IPCC reports was intended to support an international climate-change treaty. That treaty is known as the United Nations Framework Convention on Climate Change (UNFCCC). It was signed in 1992, a year after the IPCC’s First Assessment Report. That timing is very odd, because the results of that first report were inconclusive, inasmuch as the climate science community could not differentiate between natural and anthropogenic contributions. This put the U.N. in a precarious position. They had a treaty in place to limit emissions of greenhouse gases but it was without scientific support. Thus, each subsequent politically motivated report had to increase the IPCC’s certainty that greenhouse gases were the primary factor driving global warming. Otherwise the UNFCCC was dead. Because the objective of the UNFCCC treaty was to limit the emissions of manmade greenhouse gases, and because the goal of the IPCC was to prepare reports that supported the treaty, it safe to say the IPCC’s sole role is simply to write scientific reports that support a politically motivated want to limit greenhouse gas emissions. I underlined the word want for a reason. Because climate models are still not simulating climate as it exists on the planet, the IPCC has never truly established there is a need to limit emissions. Today the IPCC’s role is as defined in Principles Governing IPCC Work, “…to assess on a comprehensive, objective, open and transparent basis the scientific, technical and socio-economic information relevant to understanding the scientific basis of risk of HUMAN-INDUCED climate change, its potential impacts and options for adaptation and mitigation. The fact that the IPCC has focused all of their efforts on “understanding the scientific basis of risk of human-induced climate change” is very important. The IPCC has never realistically tried to determine if natural factors could have caused most of the warming the Earth has experienced over the past century. For decades, they’ve worn blinders that blocked their views of everything other than the possible impacts of carbon dioxide. The role of the IPCC has always been to prepare reports that support the reduction of greenhouse gas emissions caused by the burning of fossil fuels. As a result, that’s where all of the research money goes. The decision to only study human-induced global warming is a political choice, not a scientific one. As a result of that political choice, there is little scientific research that attempts to determine how much of the warming we’ve experienced is attributable to natural factors. We know this is fact because the current generation of climate models—the most complex climate models to date—still cannot simulate naturally occurring ocean-atmosphere processes that can cause Earth’s surfaces (and the oceans to depth) to warm for multidecadal periods or stop that warming. EXAMPLE: WHY DIDN’T THE CONSENSUS OF REGIONAL CLIMATE MODELS PREDICT TIMING, EXTENT AND DURATION OF THE CALIFORNIA DROUGHT? Climate modelling groups have been heading in a new direction for a number of years: regional climate models. See the NASA webpage Regional Climate Models Evaluation System for an overview. They, of course, at that website they try to paint a rosy picture, without being very open about the uncertainties caused by naturally occurring chaotic factors. We’ve become used to seeing wide ranges of uncertainties from global climate models. With shorter-term regional climate models, those uncertainties are even greater, because ocean-atmosphere processes, which are beyond the capabilities of climate models, have such wide ranges of influences on regional climate. Regardless of whether they are regional climate models or global climate models, as mentioned earlier, climate models in general are still not capable of simulating coupled ocean-atmosphere processes that dictate annual, multiyear, decadal and multidecadal changes in global and regional temperature and precipitation. As noted above, Dr. Trenberth stated that climate models still do not include a few modes of natural variability: El Niño/La Niña, Pacific Decadal Oscillation and Atlantic Multidecadal Oscillation. There are many other modes of natural variability that are beyond the capabilities of climate models, and those factors also have strong impacts on regional short-term climate. Now, let me clarify one point. I wrote above that climate models still do not include modes of natural variability like El Niño events. It’s not that they exclude a feature that they can simply select from a menu and add to the next model run. The models can’t simulate them properly. There are numerous peer-reviewed papers that document those failings. 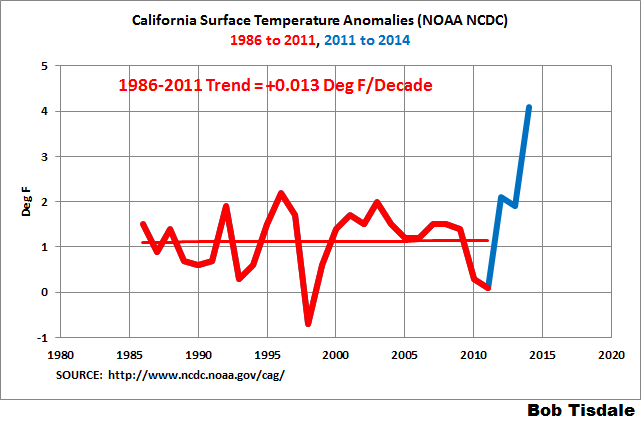 Why didn’t a consensus of regional climate models tell us that California would show no surface warming for 2.5 decades (from 1986 to 2011) as do the data? Why didn’t they tell us that a ridge of high pressure would form a few years ago northwest of California over the eastern North Pacific…and continue to persist today? That an area of warm sea surface temperatures would also form in that part of the North Pacific…an area that grew so warm it was the dominant reason for the reportedly record-high global surface temperatures in 2014? That the ridge of high pressure (now known as the “ridiculously resilient ridge”) and elevated sea surface temperatures (now known as “the blob”) in the northeast North Pacific would cause the recent record-high surface temperatures in California, along with the lower-than-normal precipitation? That the “ridiculously resilient ridge” and “the blob” would cause near record low temperatures last winter in the Northeast? There’s a very simple reason why regional climate models did not tell us all those things would happen. Climate models don’t predict weather, and the factors that are driving the drought and warm temperatures in California are weather events…persistent ones, but weather events nonetheless. On the other hand, weather models have limited value beyond a few days…a week at best. How long the California drought will last? When the drought there might reappear? What parts of the country will be plagued by drought next? Will short-term regional climate models have any value in the future? Not until they can predict chaotic coupled ocean-atmosphere processes in the Pacific and the North Atlantic and their interrelated, even more chaotic, sea level pressure-based phenomena known as the North Pacific Index and North Atlantic Oscillation and Arctic Oscillation, etc. Let’s continue to use California as an example. Until the regional climate models can predict chaotic ocean-atmosphere processes years in advance in parts of the globe that are remote to California, those models could only tell us what might happen in California if El Niño events dominated for a period, or what might happen if La Niña events dominated, or might occur if there was a shift in the related Pacific Decadal Oscillation, or North Pacific Index, or Arctic Oscillation, etc…with all of those “might happens” having large ranges of uncertainties because of their compounding effects. The uncertainties are so large that they offer little value for future planning. Then again, there can and will be, as we’ve recently seen, totally unexpected happenings like the “ridiculously resilient ridge” and “the blob” to destroy those forecasts. Climate models are not close to being able to answer the questions we need answered, and it is unlikely they will have those capabilities until such time that they can forecast chaos…years and decades into the future. And the likelihood of that is nil. Under the direction of the IPCC and the political agencies that fund it, climate science has only focused on supporting international treaties to limit emissions of anthropogenic greenhouse gases. Climate modeling has been constrained by that focus, leaving us with models that have no relationship to the world in which we live. It is time to change that focus to enable climate modeling groups to study the true contribution of natural variability to global warming and climate change without fear of losing their funding. If we are going to be able to adapt to climate change, regardless of whether it is manmade or natural, the climate science community needs a much better grasp of how climate on Earth actually works, not how it works in models. I hope you and your staffs will be able to investigate those questions and others over your terms as chairs of climate science-related committees and subcommittees. If you have any questions or if you need any further information, please have staff members leave a comment on any thread at my blog ClimateObservations. PS: The following are a collection of blog posts that illustrate how poorly climate models simulate surface temperatures, precipitation, and sea ice. We also discussed and illustrated climate models and the modes of natural variability called the Atlantic Multidecadal Oscillation and Pacific Decadal Oscillation in the post Questions the Mainstream Media Should Be Asking the IPCC. As I’ve noted numerous time in the past, climate models at present have no value other than to illustrate how poorly they perform. This entry was posted in Climate Model Failings. Bookmark the permalink. That was an excellent intervention Bob. Crystal clear and easy to follow so I suspect that the trio of Senators will be able to give this their full attention without deflecting from their other onerous obligations. At their level in government time is their most precious commodity and your letter will save them plenty of that. I echo Werner is saying well done Bob. You are an asset to us all. It’s okay to be an amaterur, Bob. But you should really try to understand those things before writing letters to senators. You seem to be utterly confused by concepts like predictability, chaos, initialisation, simulation, internal variability and so on. Modelling a process and predicting it are two very different things. Think of rolling a die. You can model it almost perfectly. It’s just Newtons equations of motion. But that will not help you to predict the outcome. It’s not because Newton was an idiot or his equations are bad. You have seen the explanation many times, obviously whithout realizing what it means. To predict something you need a model PLUS some initial conditions to start the model from. But some models are extremely sensitive to the initial values. A tiny change of starting conditions results in a large change of the predicted outcome. It’s impossible to measure the initial position of your die to the precision needed. That is why you can’t use Newton to predict it. It’s too sensitive to where you start. And that’s why you can’t predict next week’s weather or next year’s climate. Think of rolling a die again. You can’t predict the outcome, but in spite of that you can say something meaningful about the probabilites of different outcomes. You can either roll the die many times, or, equivalently, solve Newtons equations many times, whith slightly different initiial values. Then you can calculate probabilities. That is what the climate scientists are trying to do. It is complicated but certainly not ”illogical”. You should really try to understand those things, Bob. I don’t believe you read my post in its entirety, Lars. Because, if you had, you would not have come to that conclusion. ”the climate model projections of future climate are aligned with the naturally enhanced warming from the mid-1970s to the turn of the century”. That comes from your misreading of Mauritsen et al on tuning of models. That paper says ”We tune the radiation balance with the main target to control the pre-industrial global mean temperature.” It then explain how they do that in an iterated process, which includes checking parameter changes by running a standard simulation built on the observed SST’s for 1976-2005. That is not the tuning. That is a test of the tuning. The target of the tuning is pre-industrial global mean temperature. Did I use the word “tuned”, Lars? I wrote “aligned”. In reality, Lars, that statement comes from plotting model-data comparisons. You’re wasting your time here, Lars, and more importantly, you’re wasting my time. PS: The subject of the sentence you quoted is “the climate model projections” not “mid-1970s to the turn of the century”. Which indicates your comment does not relate to what was being discussed. I suggest you take it elsewhere, Lars. Lars, thanks for one again wasting your time and mine. Yes, I’ve referred to Mauritsen et al (2012) numerous times in the past, but that paper has no bearing on the quote from this post you’re complaining about. You quoted from my post, “the climate model projections of future climate are aligned with the naturally enhanced warming from the mid-1970s to the turn of the century”. 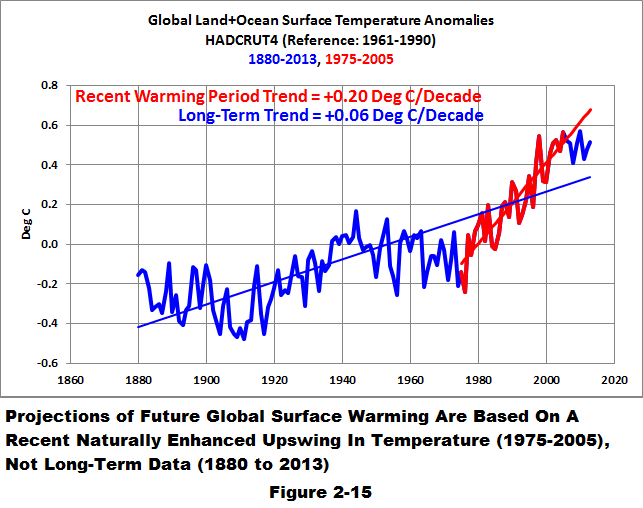 Here’s a graph of HADCRUT4 global surface temperature anomalies, with two trends illustrated. One is the long-term trend and the other is the trend from 1975-2005. Which of those two trends are climate model PROJECTIONS aligned with, Lars? I do not have the time to waste on your misunderstandings and misrepresentations, so I’m adding your name and IP address to my spam filter. I hope your excellent letter will help enhance the awareness of these Senators. They can be a factor in rising the awareness of the general public. The IPCC’s General Circulation Models (GCMs) have proven wrong in the sense that they paint scenarios that miss the details that affect the people and the rest of the ecosystem. “National Science Foundation, Department of Energy, National Center for Atmospheric Research (NSF-DOE-NCAR)”. The NSF and DOE are funding agencies for NCAR. The link you provided to “CMIP5 – Data Access – Availability” give a table of modeling groups. The entry for NCAR, fifth from the bottom of the table, shows the model “CCSM4”, while the entry for NSF-DOE-NCAR, the last one in the table, shows the model “CESM1”. It is important to note that CCSM4 is a subset of CESM1. The CCSM4.0 code base is frozen and all future model updates will occur from the CESM1.0 code base. Thanks, Ken. That whittled the problem down by 20%. I’ll correct the post.